Modern Wedding 76 – Sneak Peek! Are you ready for #wedspiration overload? Good! Because this edition is dedicated to all things now, new and next in wedding trends. Consider this your trend-taming cheat sheet: your guide to navigating your way through all the ideas and inspiration, so you can discover what’s so now and so you. And ultimately, create a wedding that’s uniquely yours. Whether #youjustsaidyes and are starting out on the planning; you’re seeking a gorgeous gown; down to the nitty-gritty of all the to die for details; looking for spectacular styling tips or wanderlusting over honeymoon destinations: you’ll find loads of extraordinary ideas and inspo. 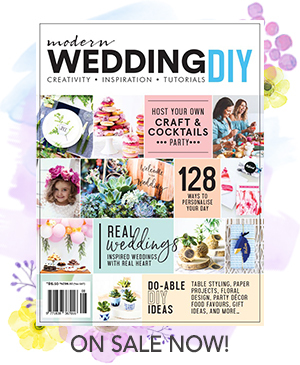 Pick up a copy of Modern Wedding 76 at your local newsagent, selected Woolworths, Coles and online! Photography: Steve Baccon using Canon Cameras / Videography: Life Studios Inc. /Stylists: Kimberlee Kessler & Rosemary Slade / Hair: Rhiane Schroder / Makeup: Helen Samaryan using Tom Ford Beauty / Flowers: Affair With George / Shoot assistant: Bryce Haslam / Shot on Location at: Leicester Gardens / Jewellery supplied by: Chrysalini , Maria Elena Headpieces & Accessories , Roman & French / Bridesmaids’ dresses supplied by: Glam Corner , Her Wardrobe , S.E by Sant Elia / Shoes supplied by: Shoes of Prey / Full fashion credits in magazine. On Sale Monday 11th September 2017!